It’s easy to check and fix all of your department site’s broken links. If a link has a strike-through on your website, that means it’s broken. To fix your broken links all at once, log into the site and go to the Dashboard. In the “Broken Link Checker” box, click the blue link that has the number of broken links found on your site. There will be a list of broken links. You can then click on each link to update it. 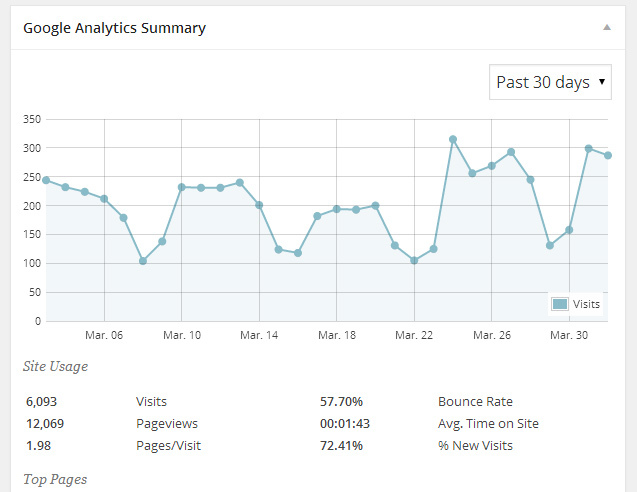 On your dashboard is the 30 day summary of your website’s traffic (you can also view the past 60 days). Check it every month to make sure everything is running smoothly. The sitemap indents the pages that are subpages (children) to show the information architecture of the site. It’s important to keep the information architecture consistent (put fall and spring undergraduate course schedules under Undergraduate, for example). Go through the sitemap once a semester to make sure that everything is in its proper place. Delete anything that’s outdated (RSVP pages or Event pages). Make a note about which pages have date-specific information (e.g. office hours or course schedules), and make sure to update them every semester. Although faculty information changes less frequently, it’s one of the most important pieces of information on your department website. At the very least, make sure everyone’s contact information is correct. Page last updated by Faculty of Arts and Sciences at 5:11 pm November 10, 2016 . This page was printed from http://fas.camden.rutgers.edu/web-office/websites/department-site-maintenance-guide/ at 1:04 AM Wednesday, April 24, 2019.